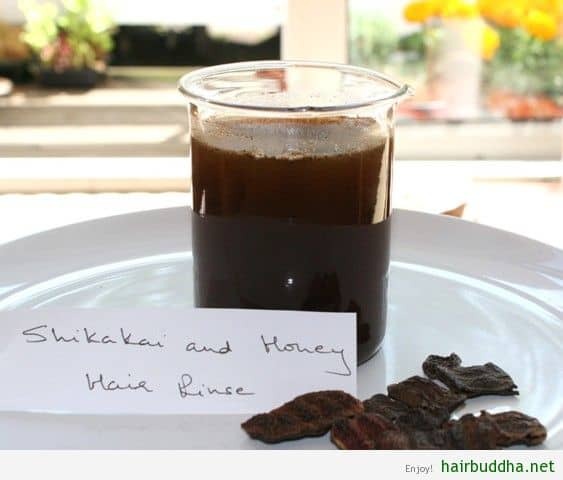 Shikakai literally means ‘fruit for the hair.’ It has been used in India for centuries as a gentle cleansing and conditioning agent for hair and skin. Rich in flavonoids, alkaloids, and various plant acids, shikakai nourishes and strengthens hair roots to promote healthy hair growth. The low pH of shikakai matches with our hair’s pH, which is between 4.5 to 5.5, and is ideal to preserve the acid mantle, that helps to keep our scalp healthy and free from microbial attack. While its natural acids help to tighten the hair shaft and keep the moisture locked in, thereby improve the overall condition of hair. Honey, a natural humectant, draws moisture from the atmosphere into your hair, and will add sheen, hydration, and luster. The antibacterial and antimicrobial properties of honey keep the scalp clean and may help with dandruff. These two amazing ingredients together nourish and condition the hair, enhance volume to make hair feel thicker and fuller, and decrease damage and breakage while adding shine and luster. Here is how to make…. Bring the water to a boil. Place the shikakai powder and oil (if using) in a cup or mug and pour on boiling water. Leave to steep for 15-20 minutes, preferably covered to avoid the loss of volatile oils in the steam. Strain the infusion. Then, stir in the honey and use immediately. I prefer the gritty rinse and don’t strain the shikakai infusion. The shikakai grit acts as an exfoliant and helps to get rid of dead scalp skin, leaving hair perfectly clean, refreshed, and silky soft. But, those with curly hair should probably strain the infusion, as the bits can remain stuck in the hair and create a messy look. 1. After shampooing as a final rinse to nourish and condition hair. Pour over your hair and catch the drippings in the mug/pot and keep pouring them through your hair until they are all used. Massage the mixture into your scalp and hair and leave in for up to 5 minutes and rinse out. 2. Just use it like normal shampoo. Shikakai contains natural saponins that gently cleans the hair without stripping it of natural oils. So, if your hair isn’t too greasy or dirty, especially post work out when it’s just sweaty, you can use this rinse in place of your normal shampoo. Tip: For shiny, soft, and manageable hair, dry your hair in the sun or natural breeze. Do not use comb or finger comb your hair until completely dry. Then, gently pull hair strands apart with fingers, and comb your beautiful shiny tresses. This rinse is one of my favorite, and I highly recommend you to try this at least once. And do share your experiences..
You are welcome, I would suggest that you try the miracle hair mask from the blog. You can also try these hair masks. I just discovered your web site and this sounds wonderful! I’m always looking for natural ways to help my hair. The question I have is, will Shikakai darken my hair? I’m a blond and I’m always a bit cautious about using anything that might darken it. Thanks. Hello Dottie, Shikakai may darken your hair, it does stain my tumbler 🙂 You can skip shikakai and use soap nut and citrus peel. You can also try the chickpea flour shampoo. OMG! I try this concoction right away, and I love the way my hair feels, it conditions the hair very well. I use shikakai and honey all the time but never combine the two together. This two ingredients are a dynamic duo that perform magic for my hair. It feel thick to the touch.BTW, I am African, I love my hair, its natural and I don’t use commercial products on my hair. I am growing it strictly Ayurvedic and African way of glowing hair, So far so good, I am loving every bit of it and the experience is fulfilling to me, Thank you so much for all those great recipes and for taking your time to share it with us. Hope to one day do the same for others. Hi Mona, Try this rinse recipe: 1 tbs coffee powder, 1 tbs amla powder, 1 tbs henna powder, 1 tbs bhringraj powder, and 2 cups water. Combine the water and all the powders in a pan. Bring to a boil, reduce the heat, and simmer till the water reduces to almost half the quantity. Remove from the heat and let cool. Strain and use immediately. To use: Massage this decoction to your scalp and hair and leave on for 30 to 40 minutes. Then wash off with plain water. Repeat this every week.